Location: My kitchen in Lansing, Mi. Basic concept shot. I'm hoping people see that the hands are framing the card in a shape of a spade. It seems obvious to me, but we shall see with the voters :-) I thought it a cool idea. In ps- cropped, auto levels adj, usm, tritone, levels adj, curves adj, resized and added border. The part of your hand in the foreground seems to be a little fuzzy, but this is an original idea. Good use of b&w. love the way the handsmake a "spade". nice idea. color looks a little flat to me. 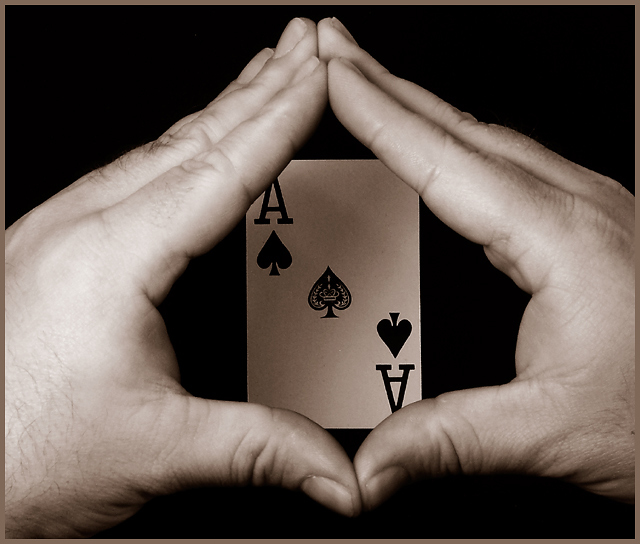 It took me a second look to realize the hands are mimicking the spade shape. The hands are just off center to the card (to be nit picky), but bumping up a point after my second, longer look. Interesting concept. the exposure of the card is dark and the hands are maybe a tad to light. Especially the left. I like it. Nice echoing of the shape. Clever and interesting idea. Pretty darn clever. 9 for you. Proudly hosted by Sargasso Networks. Current Server Time: 04/19/2019 02:19:31 AM EDT.